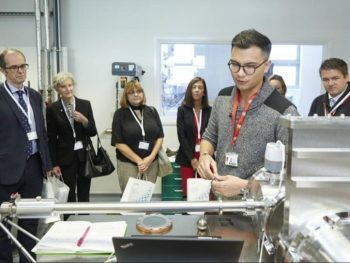 Manchester Metropolitan University has opened a £4.1m research facility, which will develop next-generation energy storage and hydrogen fuel cell technology for vehicles and buildings. The Manchester Fuel Cell Innovation Centre received £1.6m funding from the European Regional Development fund. Its remit also includes working with local SMEs to accelerate development and prototyping of cheaper, more efficient fuel cells and graphene batteries, as well as developing the region’s hydrogen infrastructure. Hydrogen fuel cells produce electricity through a process similar to a reverse electrolysis, combining atmospheric oxygen with hydrogen stored on-board. Its only by-product at the point of use is water vapour, and refuelling takes a few minutes – more like a petrol or diesel car. However, the use of expensive materials, particularly the platinum in the catalyst, is affecting the speed with which it can be adopted. MCFIC was a founder of the Greater Manchester Hydrogen Partnership, and the centre will be the region’s lightning rod for research and development in the hydrogen power and fuel cell sector.